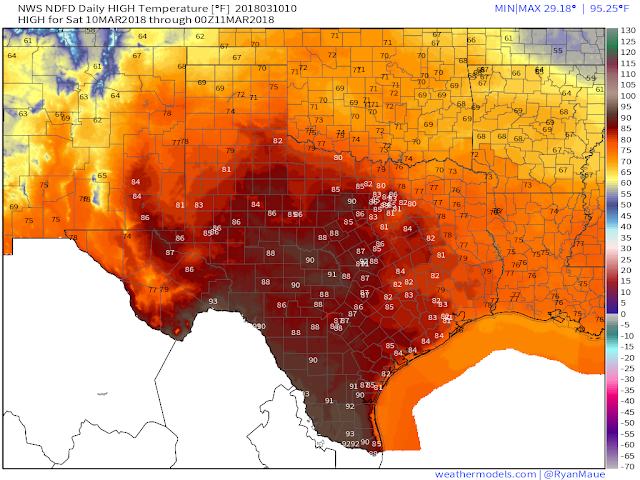 Highs Today More Like May - More Like January Sunday. Valid At 1:30 AM MST Saturday, March 10, 2018. Valid At 1:45 AM MST Saturday, March 10, 2018. 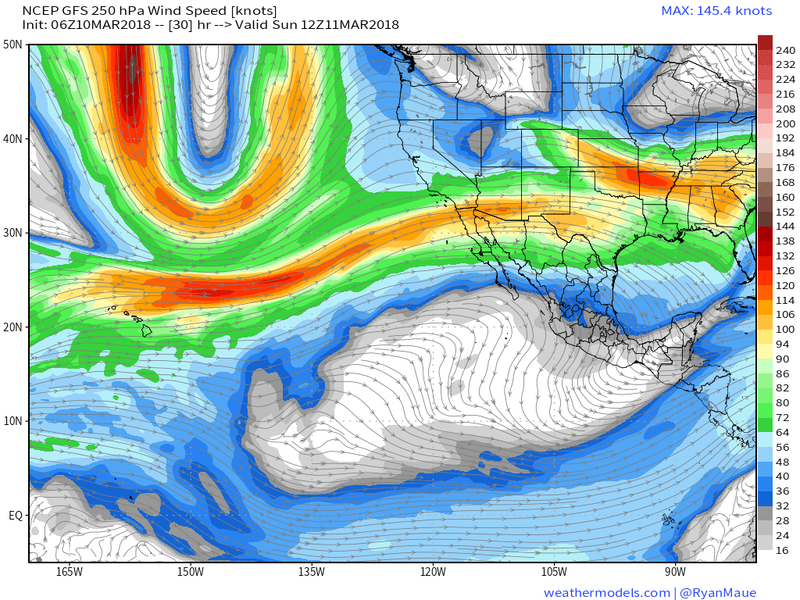 Jet Stream At 250 MB's Or 34,000' MSL. 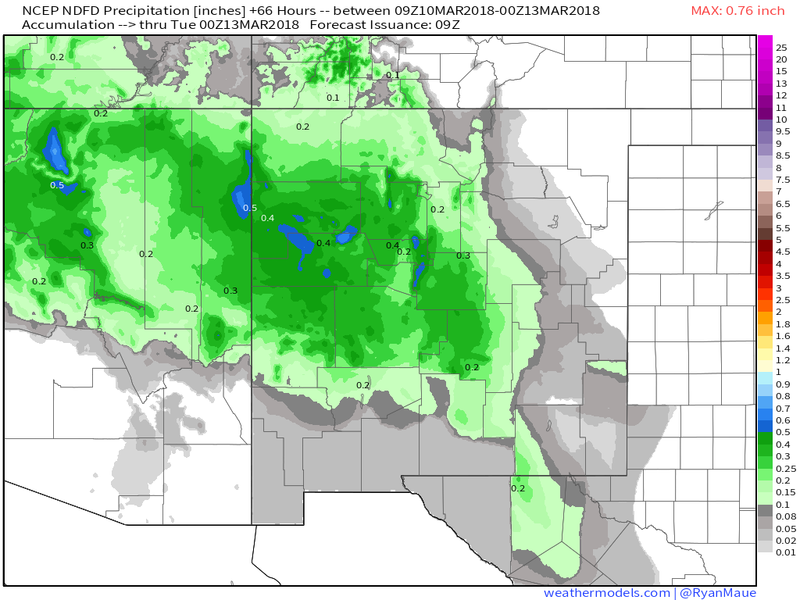 Valid At 11 PM MST Friday, March 9, 2018. Warmer sea surface temperatures aided in part by a continued weakening of La Niña across the Eastern Pacific Ocean is helping to ramp up the subtropical jet stream. 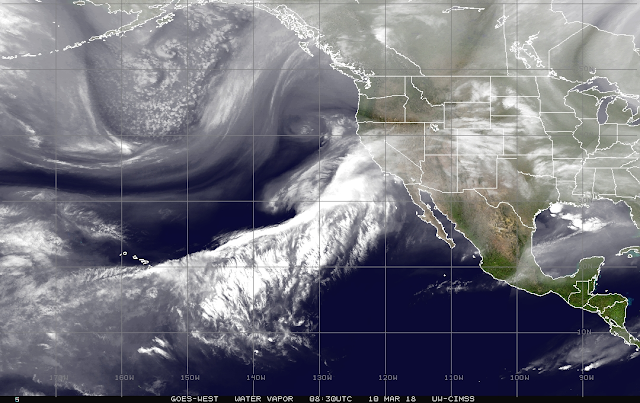 Then in turn is transporting a huge slug of subtropical moisture northeastward from near Hawaii into the California Coast early this morning. 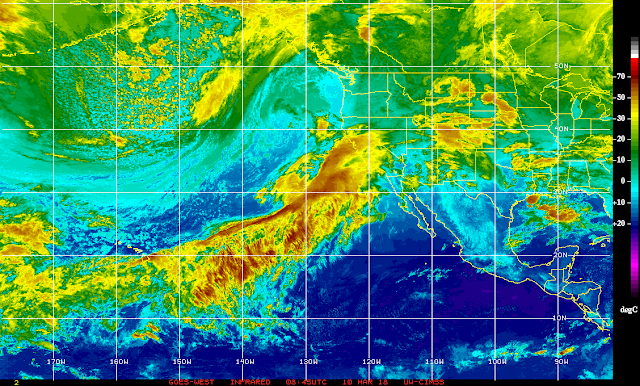 Some of this mid and high level subtropical moisture is forecast to move into New Mexico today into Monday morning aiding in the development of rain and snow. 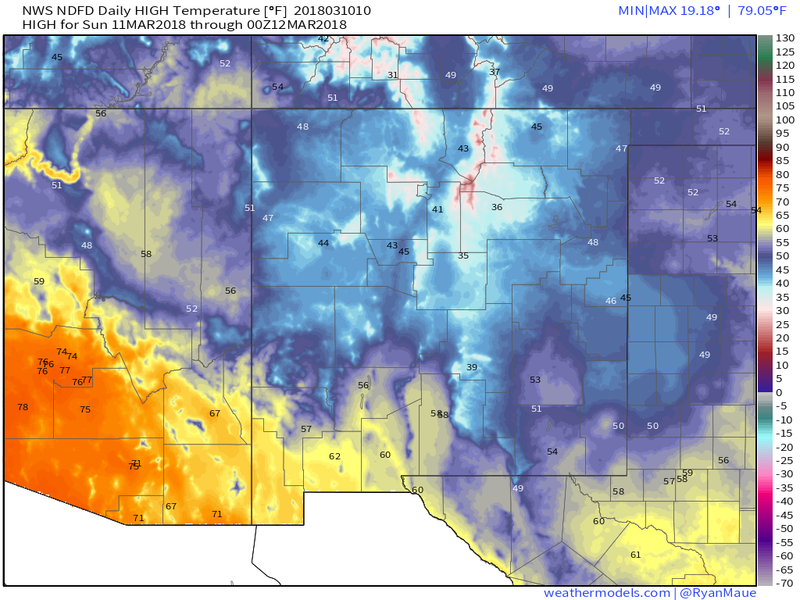 Valid At 6 AM MDT Sunday, March 11, 2018. 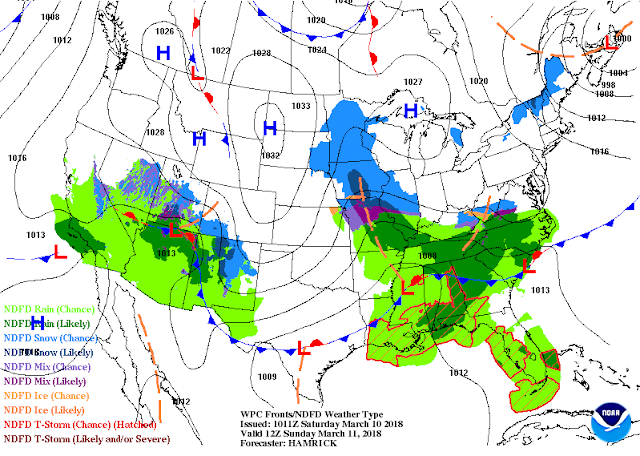 Meanwhile a short wave trough of low pressure will swing by to the north of the state this weekend which in turn will kick a fairly strong cold front south into the state today. 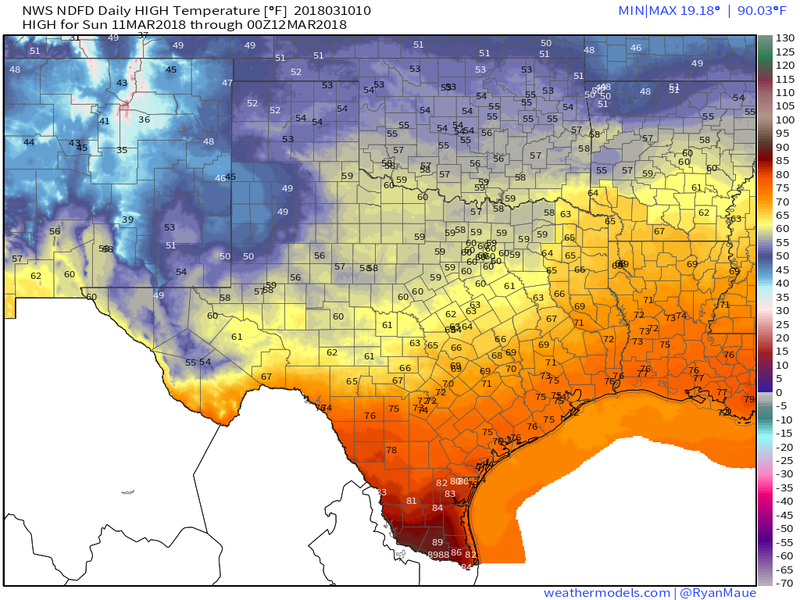 This front will move southward into the local area later tonight bringing about a 30-degree drop in high temperatures Sunday verses Saturday's highs. NWS NDFD Forecast High Temps & Temp Anomalies Saturday. Locally our afternoon high temperatures across the Southeastern Plains of New Mexico will be some 15-degrees above normal for the date with readings in the mid 80's forecast. 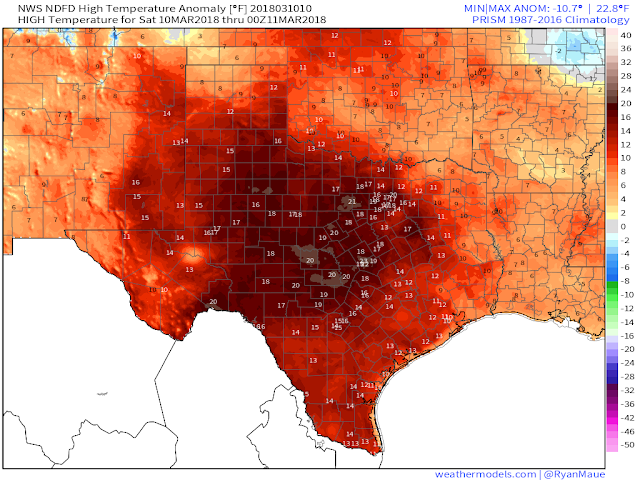 I wouldn't be surprised to see a few of our normally warmer spots get up into the upper 80's. Temperature-wise it definitely will feel like spring. In fact normal high and low temperatures for the local area for the date are in the upper 60's and low to mid 30's. Our highs today will be closer to the normal highs for May 10th than they will be for March 10th. Note also the 90-degree high temps forecast today for parts of Southwest and far South Texas. 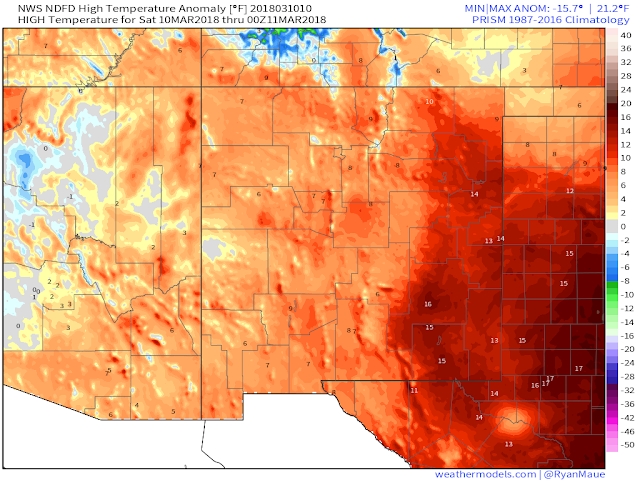 NWS NDFD Forecast High Temps & Temp Anomalies Sunday. 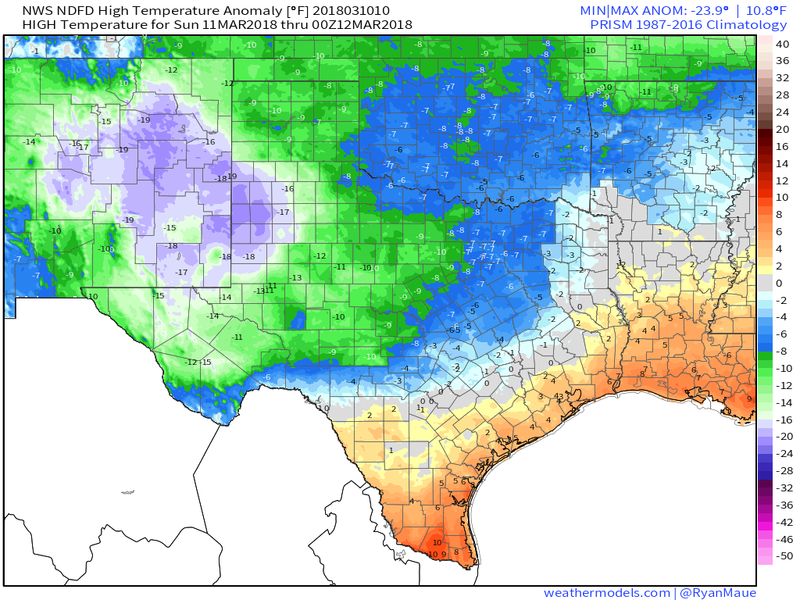 With the passage of the cold front Saturday night along with increased cloud cover and scattered rain showers our afternoon high temperatures Sunday are forecast to be some 30-degrees colder than today's highs. 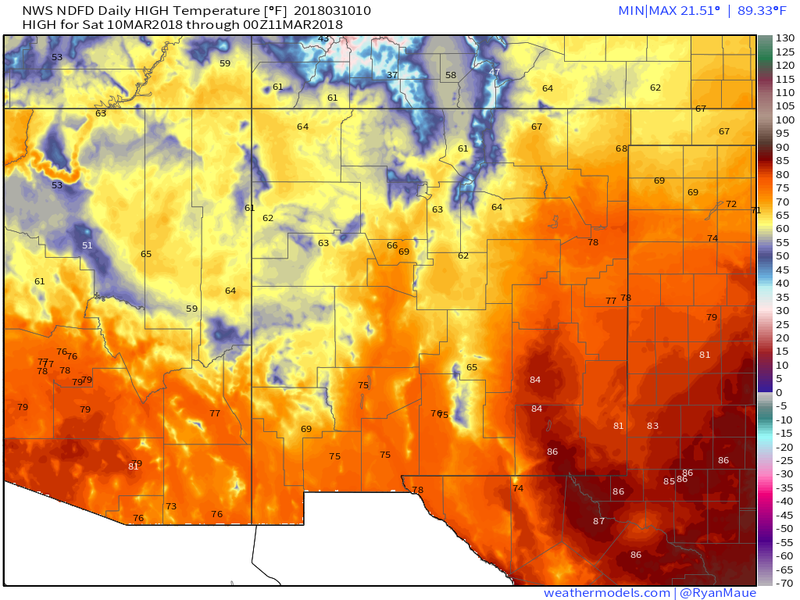 Generally in the mid 40's to the low 50's across Southeastern New Mexico. 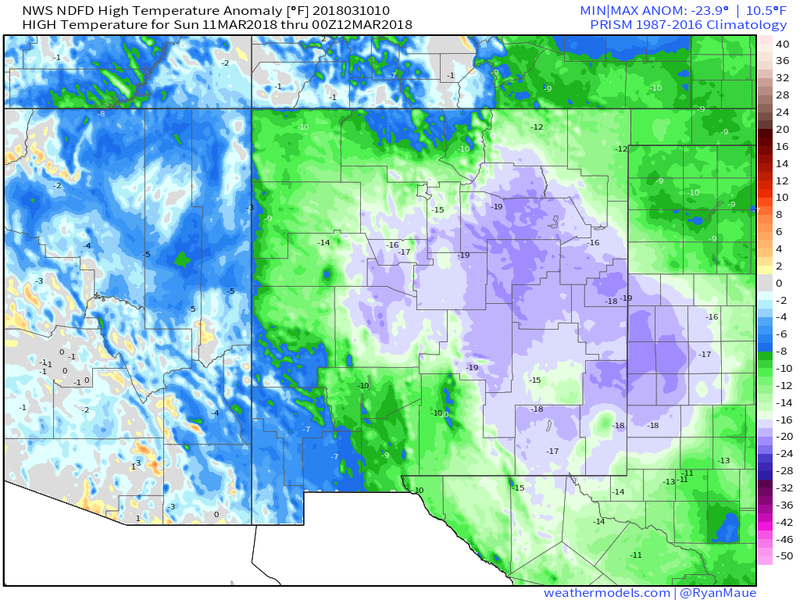 These readings will be 15 to 20-degrees below normal for the date. Storm Total Rainfall & Snowfall Forecasts. With the lack of upper level support (no significant upper level storm nearby) our chances of seeing decent rains across the Southeastern Plains aren't all that great. Generally speaking we have a 20% chance of seeing measurable rain tonight into Sunday night. As of this writing only light amounts of rainfall are forecast locally. A better chance for rain and snow showers exists across the Guadalupe, Sacramento, and Capitan Mountains tonight into Sunday night. Current forecasts call for a couple inches of snow to accumulate in the Mayhill and Cloudcroft areas. Ruidoso will see snow showers but at this time no accumulations are forecast in town. 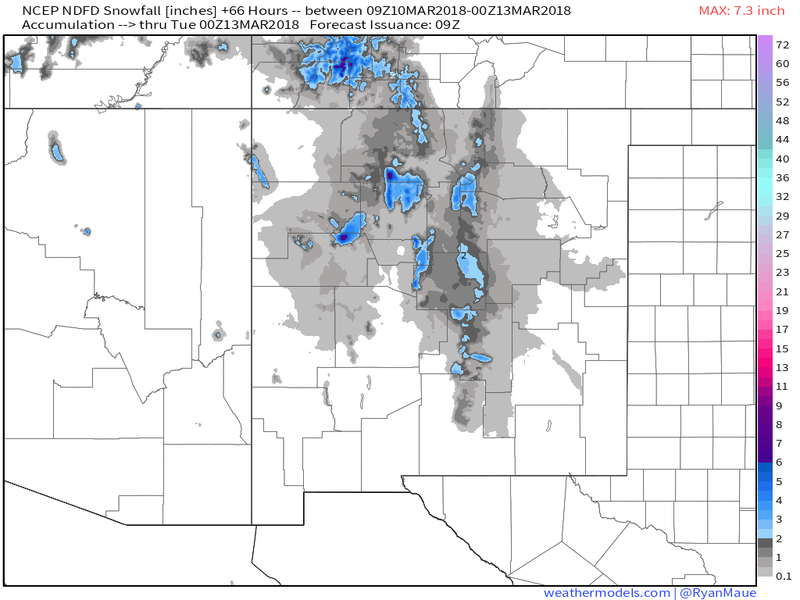 Ski Apache is forecast to pick up several inches of snow. There is an outside chance that more snow could fall than is currently forecast if some of the later model forecasts pan out.